The workshop focus on teaching you how to use just a handful of the Foundation framew’s methods to manipulate Swift string variables and constants. I encourage you to use the Variable.playground file you added in the iOS Swift Variable project to practice Swift code presented in the workshop. The Foundation framework contain many classes and methods you can use in a playground and Swift class file. 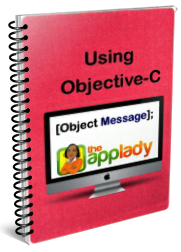 The framework class and methods are written in the Objective-C language. To use the framework, you have to add this import statement in your playground file or your Swift class file. The compiler behind the scene convert the Foundation framework classes and methods to swift modules; thus enabling you to use Swift syntax to access the framework classes and methods in your playground and Swift class file. The Swift Programming language provide many string formatting methods; however, in this section you learn how to use only three of them. This string formatting method takes two or more parameters and return a Swift String object. It is the Swift version of the Objective-C stringWithFormat: method. Here is an example of how to use it in a playground file. This method appends (joins) two Swift string objects. Code below shows how to use the method in a playground file. var stringOne = "Bananas are a good source of vitamin C, "
var stringTwo = "Potassium, and dietary fiber." This method format a string object and append it to the end of the first string object. let question = "What time is it? " let answer = "It is 8:23 am." String trimming means dropping one or more characters from either end of a string object. In this section you learn how to use a few Swift trimming methods. This method drop the last character from a string object. var message  = " It is raining outside?" This method drop the first character from a string object. This method drop white spaces off the beginning and end of a string object. let message = "  Space! These are the voyages of the starship, Enterprise.  " // Drop only white spaces from the beginning and end of the string object. The method drops white spaces and the newline characters from a string object. The Swift Programming Language provide many methods for checking to see if a word or character exists in a string object. This sections show you how to use two of them. This method check to see if a particular word exists in a string object. If it does, the method will return the boolean value true; otherwise, it will return false. The method takes a single parameter-a word or character and it is case-sensitive. let message: NSString = "Space! These are the voyages of the starship, Enterprise." Space! These are the voyages of the starship, Enterprise. This method check to see if a particular word exists in at the beginning of a string object. If it does, the method will return the boolean value true; otherwise, it will return false. The method takes a single parameter-a word or character and it is case-sensitive. let message: String = "Space! These are the voyages of the starship, Enterprise." This method check to see if a string object is empty. If it is, the method return the boolean value true; otherwise it return false. var question = "Why did the chicken crossed the road?" Concatenating means joining two or more objects together. The Swift Programming provide two operators for concatenating (joining) string and character objects. The Addition operator is for concatenating string and character objects. The addition assignment operator is for appending a string or character object at the end of an existing string object. var textMessage1 = "Judy I will be home late tonight, "
let textMessage2 = "so don't wait up me." var userName = "April "
The Swift Programming Language provide two methods for counting the number of characters in a string object. Each method takes a single parameter-a string object and return an integer value. This method returns the number of characters in a Swift string object. The utf16Count method is the Swift version of Objective-C’s length method. Further more; the method does not count emojis correctly; so you should use the countElements() method instead. Code below shows how to use it in a playground file. var question = "What color is the sky?" var answer = "The sky is blue." This method returns the number of characters for any sequence, not just string object. Code example below shows how to use the countElements() method to get the length of a constant object that was initialized with only three emoji values: top hat, dress, and jeans. If you were to use the utf16Count method on the emojis object the compiler would have displayed the incorrect number 6 in the Result Bar. The Swift Programming Language provide two methods for grabbing characters from an existing string object. These methods take only one one parameter-the index position where to start grabbing from. Characters in a string object are zero-based. This mean the first character index number in a string object is zero, the second character’s index number is 1, and so forth. This method grab characters from an existing string object. It take only one parameter-the index position where to start grabbing from. Code below shows how to use the substringFromIndex() method to grab the last two words from a string object. Here is a visual of how the substringFromIndex() method’s invisible index pointer works to move from index 6, grabbing every character until it reaches the last character in the sentence string object. This method grab characters from an existing string object. It take only one parameter-the index position where to stop grabbing from. Code below shows how to use the substringFromIndex() method to grab the first word in a string object. Here is a visual of how the substringT0Index() method’s invisible index pointer works to move from index 0, grabbing every character until it reaches index 4 in the sentence string object. Her’s how to use two Swift methods to convert a string object to an array object. This method convert words in a string object to an array object. The method use one separator for extracting the string object’s words. As you can see in code line 2 belowe, the space character was used as an extraction separator. let sentence = "night watch man"
This method convert words in a string object to an array object. The method use two characters as separators for extracting the object’s words. let sentence = "night watch man 5-4-3-2-1"
You can change each letter in a Swift string object from lowercase to uppercase and vis versa. Code below shows how. let sentence1 = "Girl your hair is on fire!" var sentence2 = "I AM THE NIGHT WATCH MAN"